Sunset Magic™ Crapemyrtle has brilliant red flowers and it blooms more heavily than other red crapemyrtles with dark foliage. Its deep black-purple foliage holds it’s color into late Summer. 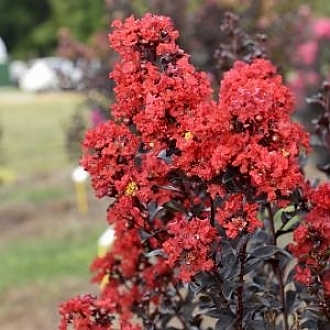 Like other crapemyrtles in the Magic™ series, Sunset Magic™ is Cercospora resistant.